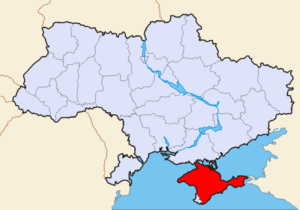 Ukraine has declared large swaths of airspace forbidden to civilian flight operations, reports the Russian news agency TASS. According to a representative of the Russian civilian aviation authority Rossaviatzia, Mr. Sergey Izvolsky, the restricted areas ĺie over international waters as well as Russian territorial waters to the southwest and southeast of the Crimean Peninsula. According to Mr. Izvolsky, no reason has been given by the Ukrainian authorities for the airspace closure. It is worth noting that the Ukraine, as most other countries, does not recognize Russian territorial claims to the Crimea, thus making the airspace in question located over its own territorial waters. This type of dispute has the potential for rapid escalation, as any military operations such as missile tests performed by the Ukraine in what Russia perceives as its airspace will likely meet with a firm response.